Last Tuesday in the city of Aachen, Emmanuel Macron and Angela Merkel signed a treat to deepen collaboration between both countries and give a new impulse to the EU. This treaty is heir to that signed by Charles de Gaulle and Konrad Adenauer in 1963, known as the Elysee Treaty. The toughest critics describe it as another attempt by European leaders to hide the truth, that is to say the attempts at European integration which have not come 100% into being and a Euro that will collapse in the short term. Nothing which has not been heard before. From Alphavalue’s point of view (with a clear pro-European position), the Aachen meeting is simply an opportunity to spotlight some valuation ratios through country level analysis. We continue to observe that, 56 years later, few French investors will know what Deutz is doing and few of the German counterparts will have looked at Virbac, just to cite two companies. 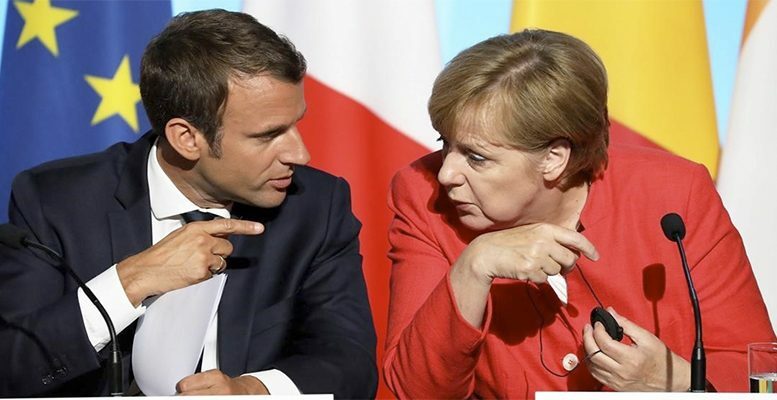 According to Alphavalue, the relative performance of German and French coverage over the last five years shows that both have had, essentially, a similar performance until Donald Trump’s last year reduced the forecasts for global growth. This had a direct on German shares dependent on exports. Below there is a comparative summary of the two coverages produced by Alphavalue’s analysts. 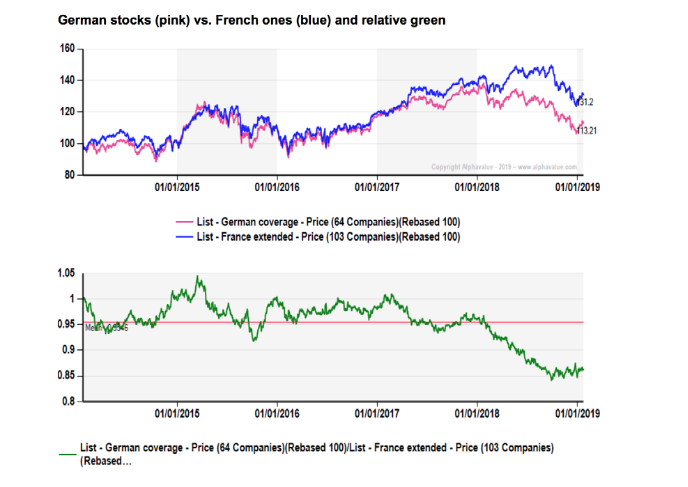 At the time of the analysis, the upside potential of French shares is higher, with +17% compared to +9% for German shares, but this can be interpreted as an innate caution shown by German analysis houses. The risks are almost the same, but, curiously, the business models seem less solid (fundamental strength) in Germany. This is in grand part due to the volatility in margins in the car sector, as well as the “second industrial line” (Bilfinger), Thyssen Krupp, SGL Carbon. In non-financial metrics, the two coverages are also surprisingly similar. Let us take into account governance ratios, average wages, exposure to the dollar or exposure to Asia. France is more dependent on the US, and Germany is more oriented towards Asia. As for good government, German companies seem to have a small advantage. In short, it is no surprise that the two largest continental economies hardly show any differences. The Treaty of Aachen of 2019 may not be important in terms of political convergence, but the economic reality of globalisation has already achieved it with listed shares.